The slow cooker is my food best friend lately. I've been using it several times a week. It does, of course, require menu planning so that I know what to thaw, put in the slow cooker in the morning, and what ingredients I need to have on hand. But as a frugal mom of toddler twins, it's essential for me to plan ahead so that our meals go as smoothly as possible and I resist the temptation to order take out. I also like versatile dishes where I can use up some things in the fridge and pantry to create a delicious meal like this ranch chicken. It's versatile because you can add or remove vegetables based on what you have. I use chicken, corn, peppers, and onions - you can use any/all of these and/or others like black beans, pinto beans, jalapeno, green onions, etc. I topped mine with cilantro, cheddar, salsa, and sour cream, but other options are avocado, shredded lettuce, chopped tomato, pickled jalapenos, etc. It's also nice served with a side of corn chips (or sprinkle crumbs from the bottom of the bag on top for a little crunch). You can also wrap it up in a burrito shell! Easy family friendly meals like this are what work in our life right now. This recipe will serve about four people, but can easily vary (stretch it with beans or make more rice). 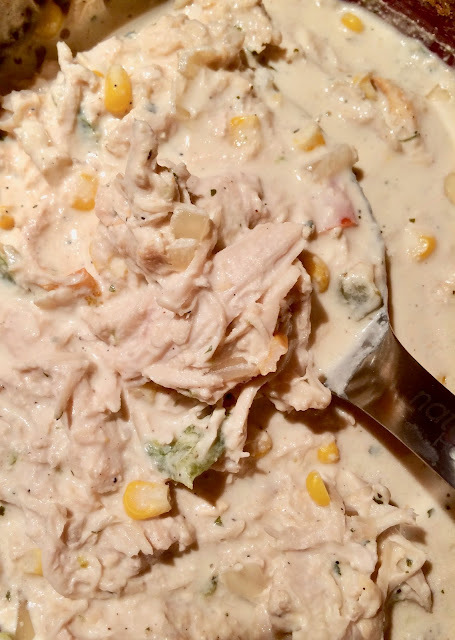 Place the chicken through corn in your slow cooker on low and cook for about 6 hours, until the chicken is tender and cooked through. Use a fork to stir up the sauce and break up any cheese clumps. Then shred the chicken with two forks. Serve over hot rice topped with your choice of toppings. 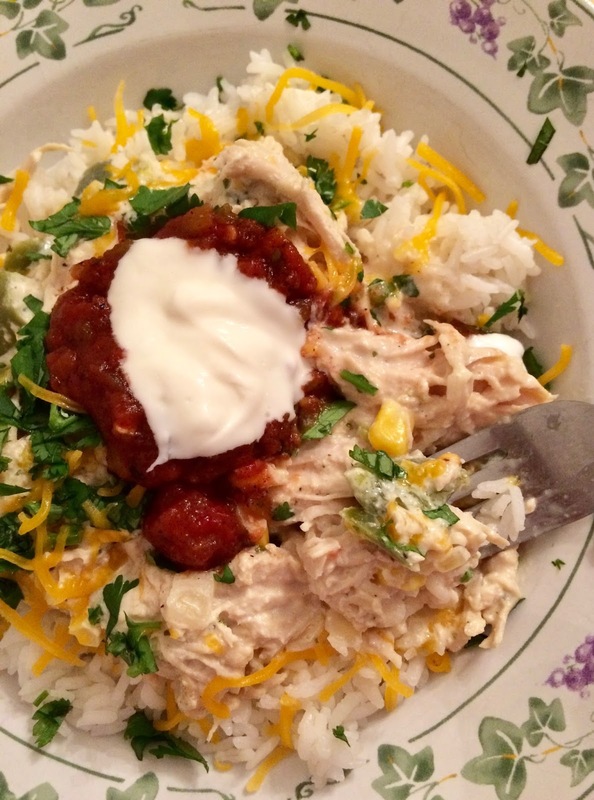 The slow cooker chicken looks so comforting and delicious...a perfect weekday meal, Amy. Yum! Looks good, Amy! I need to pull out the slow cooker now! sounds delicious, amy!! i want to try this! 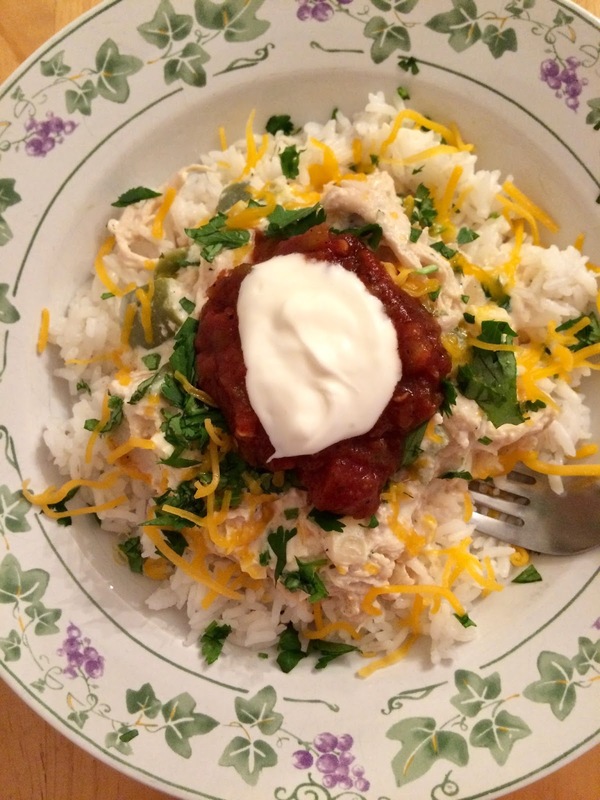 Love that this meal can be slow cooked, such a great chicken dish! our oven is currently out of order, so i've been looking for great slow cooker recipes! yum! Easy and delicious! This is so simple even I could figure it out! hahaha. Putting this STRAIGHT on my meal plan for next week. This is what I call comfort food! Reminds me of a creamy chicken and rice dish my mother made when I was a kid. Great recipe! Total comfort food! Looks so yummy! This looks delish and super easy! Can you believe I've never used a slow cooker? Crazy, I know (haha). While going through my mom's cupboards these last few weeks, I found a brand new slow cooker which she has never used or even opened (!!). So I've taken it home and plan to use it finally. This looks like a great quick meal. You can never go wrong with a delicious chicken and rice bowl! Slow cookers are certainly a time and life saver for busy families. This recipe sounds wonderful. The slow cooker is my best friend too! It saves me when I need to make dinner but am low on time. These chicken rice bowls look YUMMY! Pinned!